There she was. The Virgin Mary. Standing right in front of Bernadette, the miller’s daughter, who saw her eighteen times. In a cave. In 1875. Just outside Lourdes. And the vision told her to drink of the spring water, and to wash in it. 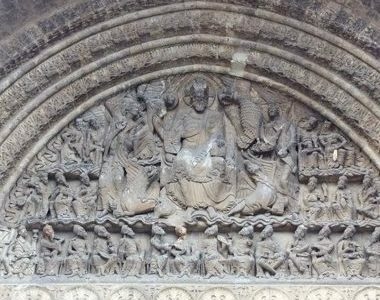 Lourdes: a place of many miracles? Then, following a thorough investigation by Church authorities, this miraculous appearance was verified. And that’s why Bernadette was made a saint in 1933. 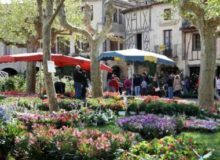 And it’s also why this pretty town in the Haut Pyrénées attracts so many visitors. Six million pilgrims flock to the cave every year. 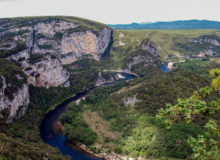 This makes Lourdes second only to Paris in the number of hotel rooms available in France. Many of the visitors and pilgrims hope to experience another miracle. And some of them do, apparently. 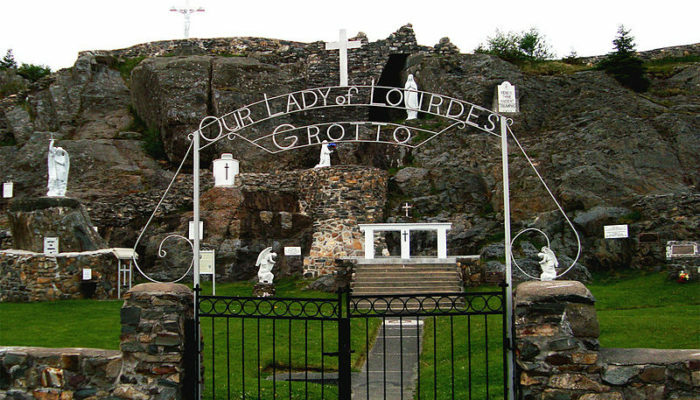 Dozens of seriously ill people leave the grotto every year convinced that they have been cured of some maladie or other. Discarded crutches, calipers and wheelchairs bear witness to these allegedly miraculous cures. Proving that a miracle has occurred is no easy matter. Pilgrims make c. 35 claims each and every year. Certain facts need to be established, for a cure to be recognised as a miracle. Amongst others, the cure must be immediate, complete and permanent. The Church claims the verification process is an “extremely rigorous scientific and medical” investigation. Provided the cures are medically inexplicable—and therefore a possible miracle—the case goes to le Comité Médical International de Lourdes. Then, following a convoluted path, it moves on to the Vatican where the final decision—miracle or no miracle—is made. Lourdes water flows from a spring in the grotto. A system of taps allows tourists to drink and collect water from an imposing cistern near the shrine. And the more intrepid faithful can even experience total immersion in a series of baths or piscines du sanctuaire. But beware, the water is reportedly very cold. Emile Zola did not like the look of bathing in Lourdes water. 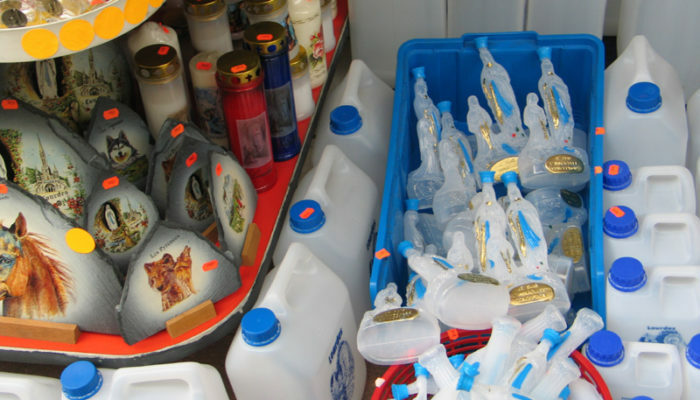 Souvenirs in Lourdes are a lively industry. For those unable to travel—no problem. 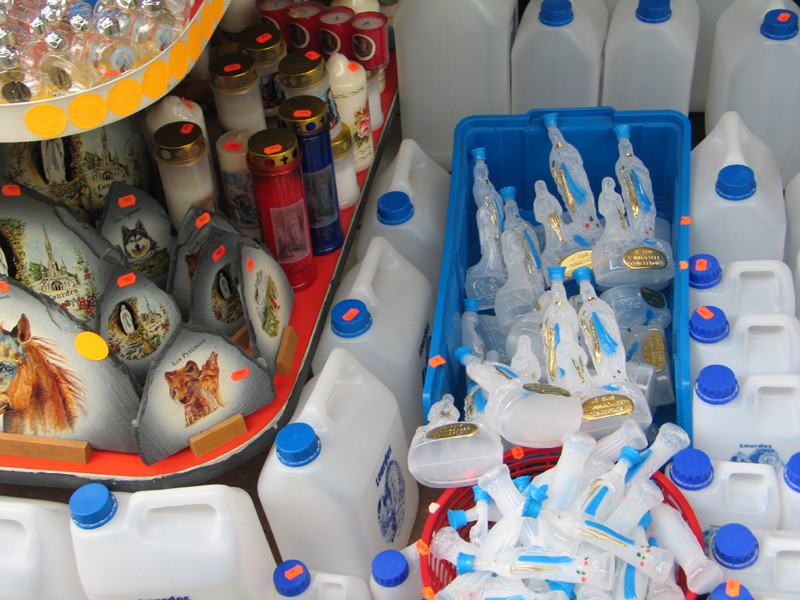 A five-litre container of water is available from Amazon: “We certify that each container is filled by ourselves with the Holy water from the Grotto of Lourdes.” And it can be delivered to your home for only two hundred US dollars. Candles are also on the list of best sellers. 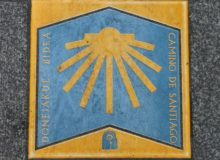 Lourdes: religious exploitation or a great experience? 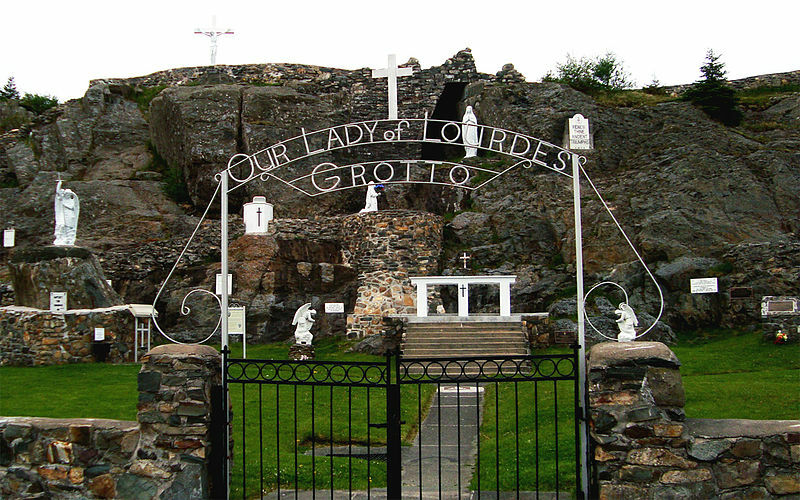 Many critics see Lourdes as tacky commercialism and even downright religious exploitation. But, why get negative just because of the marriage of religion and commerce? Countless tourists all over the world have a bucket list of ever-popular devotional shrines they’d like to visit. St Peter’s in Rome are visited by millions of secular visitors every year. And an associated gift shop is always close at hand. So, if your travels take you anywhere near Lourdes in Southwestern France, do pay it a visit. It’s a great tourist experience and a fascinating place. And if your gout doesn’t immediately disappear after drinking the (free) holy water, why not carry home a litre or two in case a delayed-action miracle kicks in? And while you’re there, for just ten euros or so, you can pick up something you’ll be surprised you were ever able to live without. Your very own Virgin Mary snow globe desk ornament. 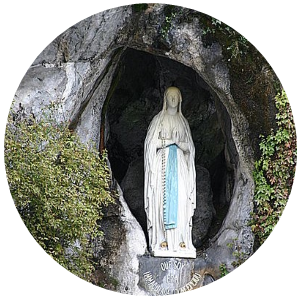 Have you ever visited Lourdes? 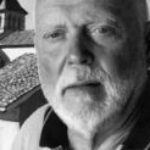 Do you consider it tacky commercialism, or a religious site? We’d love to hear your thoughts and comments in the box below!